Fruit is important for a healthy diet and plays a big part in homemade ice cream, especially gelato making. 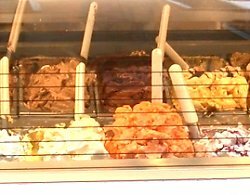 The idea of making your own homemade gelato is very appealing and there are just as many variations of recipe for making it as there are for 'standard' ice cream making, so it's a mammoth subject to cover, but what fun! Below are just a few ideas to help get you started on the road to making good gelato. Very traditional in Italy in fact. What about other types of recipe? Well, here is a peach gelato recipe courtesy of the Los Angeles Times which you can try. Sounds absolutely delicious! Morelli's Gelato have a wonderful ice cream parlor in Harrod's, London where you can enjoy freshly made gelato and all manner of ice cream sundaes. 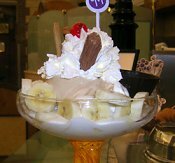 This photograph (left) shows an ice cream sundae actually made at Morelli's. With chopped banana, whipped cream and a variety of gelato ice cream, toppings and wafers, it's the kind of ice cream sundae you only dream about!